from the comfort of your own home via GrubHub & Uber Eats! Departed Soles Brewing Co. Philoso-Rapper, Jersey City, NJ** 7. Carton Brewing SS Hief Imperial IPA, Atlantic Highlands, NJ** 7. Carton Brewing BOAT Beer, Atlantic Highlands, NJ* 6. 6 Point Brewery The Crisp Pilsner, Brooklyn, NY* 5. 21st Amendment Sparkale Rose Ale, San Leandro, CA* 5.
tres leches birthday cake 12. Enjoy the Step from home with GrubHub! Weekdays @ Step | Why Limit Happy to an Hour? On Tuesday, April 9, we will proudly host our friends from the Atlantic Highlands - Carton Brewery - for Chef Nick DeRosa's special five-course presentation, developed with Carton's beers in mind. Join us for an evening of delicious proportions - from the brews, the bites to the jazz funk musings of GooGie Semple (@googi3) on April 9th from 7:00 - 10:00 PM. To reserve, please call us at 201.721.6115 or email evan@kitchenstepjc.com. Did you know that NOW you can enjoy all that the Step has to offer from our kitchen from the comfort of your own home? In just a few clicks you'll be chowing down on any one of our comforting classics or savoring one of Chef Ryan DePersio's delightful interpretations of traditional American or Italian cuisine. Whether in your own warm and inviting atmosphere OR our own, our promise to provide thoughtful, market-inspired cuisine does not waver. Check us out tonight by clicking here. Unwind at The Kitchen Step's Happy Hour, every Monday - Friday from 5 to 7 PM; specials include $5 glasses of Battello Cabernet Sauvignon, Battello Chardonnay, and ALL draft beers. Enjoy all night specials on Wednesdays. Join us this weekend to check out our delicious brunch featuring a selection of sweet and savory items, from our vegan friendly cashew 'ricotta' to the decadent guest favorite goffle road chicken and waffles, with a honey-sriracha glaze and buttermilk gravy. Brunch - which also features a special cocktail menu, available exclusively to our brunch guests - is offered every Saturday from 11 AM to 3 PM and Sunday from 10 AM - 4PM. Get the food you love from The Kitchen Step delivered to your door fast via our newest delivery partner, UBEReats. To order, simply download the UBEReats app, search for The Kitchen Step and select your favorite menu items to add to your cart. Check out and keep track of your order's delivery status directly on the app as well. Now that's what we call #FORKYEAH!! Just in time for the unofficial kick off to summer, The Kitchen Step is excited to announce our patio is now open! Join us fand enjoy the beautiful outdoors with one of our delicious cocktails or a glass of wine in hand and your favorite dish from our dinner or brunch menu. Patio seating is first-come, first serve. Introducing The Kitchen Step, a neighborhood bistro in the downtown Van Vorst section that celebrates Jersey City’s rich history and delivers thoughtful market-inspired cuisine and craft cocktails in an intimate and inviting atmosphere. Just as appropriate for an after-work drink as it is for a full-coursed dinner, The Kitchen Step offers a market-inspired modern American menu marked by executive chef Ryan DePersio’s creative, flavorful interpretations of classic American cuisine. We hope to honor the spirit of Cornelius’ hospitality and celebrate his mark in Jersey City history by turning out fresh, welcoming cuisine for all of our guests. 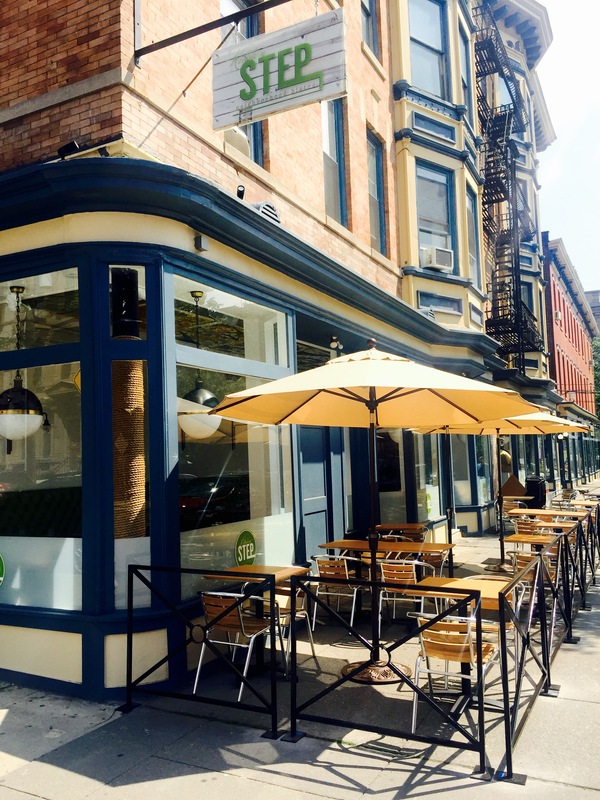 A fixture of the Hoboken bar and restaurant scene for more than 15 years, The Kitchen Step is Checket’s third endeavor – including Hoboken’s Turtle Club and Battello, located in the Newport section of Jersey City. A certified sommelier, Checket continues to pursue his passion to deliver exceptional food paired with flawless service all of his restaurants in the state. Throughout his career, owner Joe Calafiore has assisted in opening of several notable New Jersey restaurants, including the opening of Battello where under his leadership the restaurant has flourished into one of New Jersey’s premier private dining and catering destinations. Recognized as one of New Jersey’s most talented and respected chefs, executive chef Ryan DePersio brings a wealth of epicurean knowledge and award-winning experience to all of his kitchens. At The Kitchen Step DePersio flexes his modern-american muscle, delivering a menu that regularly changes the seasons and features the best of what local markets have to offer in regard to ingredients and flavor. Drawing from his vast experience in the restaurant industry, which has included stops at 3 West, Mendham Golf & Tennis Club, Battello and most recently Hoboken Turtle Club, Russell’s management style is centered on the philosophy that no sum is greater than its individual parts. At The Kitchen Step, Russell leads a team in pursuit of the deliverance to guests an unforgettable culinary experience that can be described no other way than exceptional. With a wealth of culinary experience and knowledge, barman Ray Keane’s career started in Chicago as a member of the pastry team of Michelin 3-star rated Alinea. A trained pastry chef, Keane takes aspects from all of his culinary experiences to craft thoughtfully seasoned cocktails that seek to evoke memories and excite ones taste buds. At The Kitchen Step, Keane leads a cocktail program that showcases his diverse background, with libations that engage all of ones senses. A true son of the Garden State, DeRosa brings to the Kitchen Step a wealth of relationships he has harvested throughout the course of his career, from established and respected purveyors such as Zone 7 and Local 130 Seafood, who share in his philosophy. At the Step, DeRosa builds on executive chef Ryan DePersio’s locally-driven cuisine via a vibrant, creative and faithfully seasonal menu that spotlights the talent of New Jersey’s purveyors, transforming ingredients via techniques such as curing and smoking – all done in-house – into something vibrant, daring and unforgettable. The Kitchen Step's intimate and inviting atmosphere, market-inspired American cuisine and friendly service presents the perfect location for any celebration. Gather at The Kitchen Step with friends, family or business associates to celebrate your special occasion. To inquire about hosting your event at The Kitchen Step, simply fill out the inquiry form on the right or call us at 201.721.6115. Vote for Your Favorites in the 2018 Jersey Choice Restaurant Poll!